SOUTHFIELD, Mich. – The Marburger STEM Center at Lawrence Technological University (LTU) offers more than 20 engineering, science, design and technology summer camps for high school sophomores, juniors and seniors interested in improving their academic preparation while previewing career fields and college experiences. The week-long summer camps will be held from June 22 through July 24. There are camps for architectural engineering, architecture and interior design, automotive engineering, basic design, biomedical engineering, biotechnology, civil engineering, electrical and computer engineering, forensic science, game art, imaging and graphic design, industrial design, nanotechnology, psychology, sketching for architecture and design, transportation design, and web design. Expert professors will introduce participating high school students to the latest innovations in modern labs and studios. Current Lawrence Tech students will also assist campers. Students can commute or live on LTU’s campus to get a glimpse of college life. The high school students can live in college housing, eat in the cafeteria, and participate in organized activities each evening. Camps cost between $550 and $800, based on subject and whether the student lives on campus. There is a $100 discount for attending two camps and a $200 discount for attending three camps. Registration closes June 1. Save $50 per camp by attending Blue and White Days (www.ltu.edu/blueandwhitedays) on Lawrence Tech’s campus. Top students in each camp will be eligible for scholarships to Lawrence Tech. Early registration is recommended as the camps fill quickly. Additional information and all registration forms are at www.ltu.edu/community_k12/summer_camps. For more information, contact Assistant Provost Lisa Kujawa atsummercamps@ltu.edu. 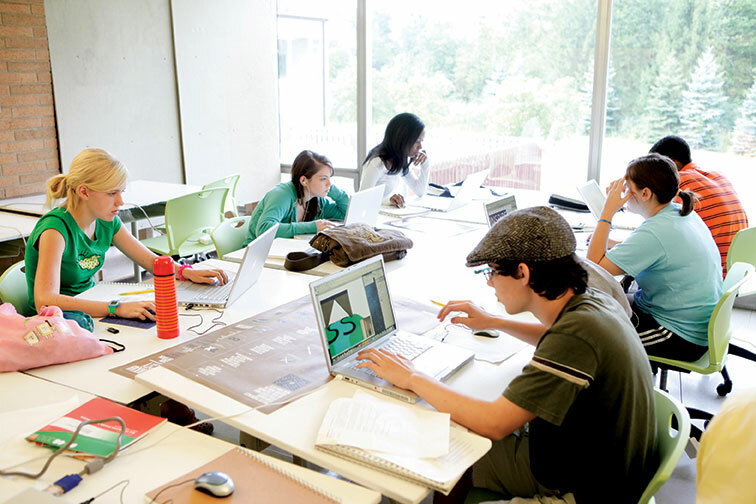 High school students study design at a Lawrence Tech summer camp.